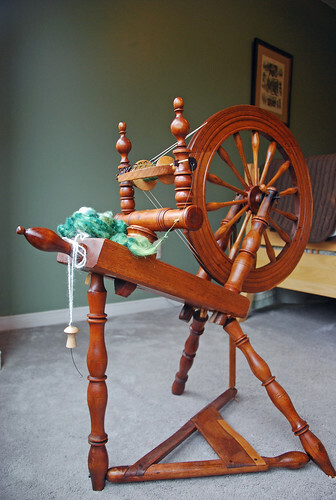 On what was a pretty ugh day, the restored flyer for my antique flax wheel arrived in the mail. It’s been cheerful around here ever since! Regular readers & Twitter followers may remember this wheel as coming home by accident from the Ramer spinning wheel collection. Not all of my wheels have names but hers is Linley. Along with other repairs, Alvin Ramer re-built her flyer. 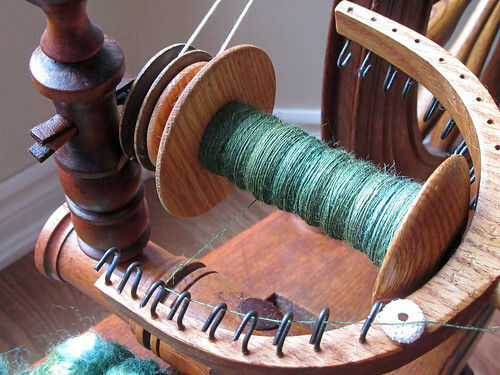 It has the wide arms that I love for wet spinning flax, and he also made 3 new oak bobbins. The issue was inside the antique whorl, and it completely lost all traction after I had a blast spinning 618 yards of 2-ply yarn from silk caps. It was too loose for a teflon tape fix, and I needed professional help. 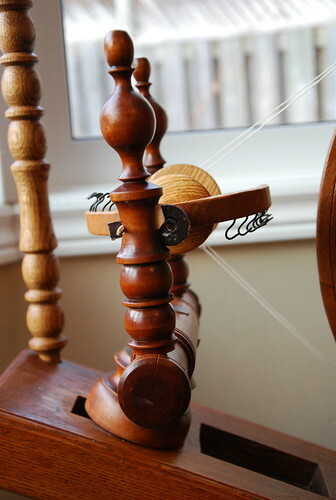 Non-spinners, this is code for I got lots of twist but the wheel could not wind the yarn onto the bobbin. 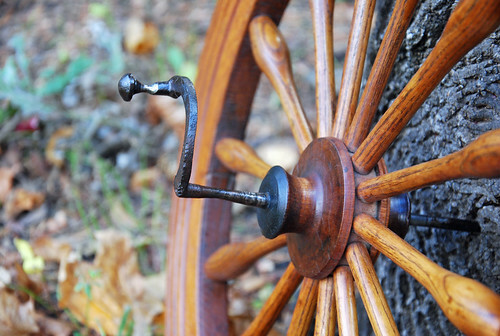 Tension is the magic that allows your wheel to fully function. And it is probably the single most important thing you can learn about your wheel. Reed Needles, Wheelwright in St. Mary’s Ontario gave me an on-the-show-grounds consultation at Woodstock this October, and now we are back to working order. If you haven’t met Reed, the CreativFestival blog has that nice feature post about his work & with tips on restoration issues. The orifice hook that you see in the 1st image is also Reed’s work. It is custom to fit the wheel’s 7 mm diameter opening. This is slightly larger than 4 mm diameter of the William McDonald Nova Scotia flax wheel fluted orifice for example but is way too small for Reed’s standard hooks. He has my thanks for such a great touch. The bent paper clip is gone, Reed. It is really gone! 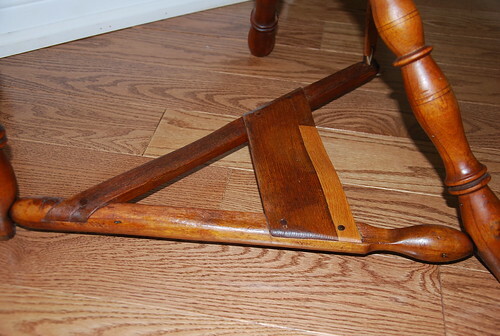 In looking over the wheel, Reed had observed that the maker used cedar for her treadle. This is a strong indicator for a Canadian origin. I am going to edit my earlier posts to add a note rebutting the Irish presumption! Those posts still get views through search engine traffic. Reed also shares my love for Canadian flax wheels. It was wonderful to hear his positive evaluation, and interest in my find! 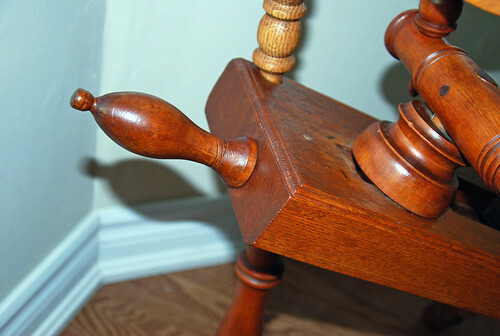 The main wood is quarter-sawn oak, and Reed also liked what first drew me in as well, the craftsmanship in her details. The tension screw matches the maidens’ design beautifully for example. Decisions are still pending, and I am treating the wheel gently. Now that the flyer is stable, I am sure of a current alignment issue with the drive wheel. Generally solid as a rock. A temporary fix has been to add smooth leather in the wall of the rear bearing. Following advice shared in the Antique Spinning Wheels forum on Ravelry, I will also try to improve the situation with copper. My other idea was to tape the axle wear points as a way to watch for more wear. Ultimately, I may need to consider a replacement for the axle. That’s a big repair. I have also explored brazing a little but am concerned about possible weakening of the metal in the process. If anyone has thoughts or insights, I would love to hear from you. This is a new issue for me to learn about! It’s been good spinning of late, and I wish the same for you! This Polwarth project is up to 910 yards and counting on the Spinolution Mach 2 from a pound of undyed top. 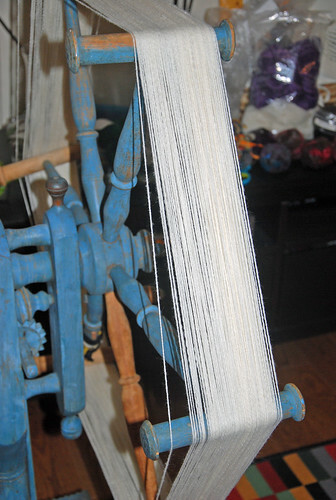 Categories: Spinning | Tags: Antique spinning wheel, Equipment, Polwarth wool, Tussah silk | Permalink.